Zulu weavers wrap coils of wire similar to telephone wire around a solid metal core to create these 'hard wire' baskets. The geometric designs recall the patterns of traditional Zulu beadwork. These are incredible, intricately designed African baskets. Handwoven out of wire similar to telephone wire, the mezmerizing colors and patterns put a modern twist on traditional basket weaving in South Africa. These are sometimes called 'hard wire' baskets for the stiffness of the walls, the wire wrapped around a solid metal core results in the substantial weight of this basket. 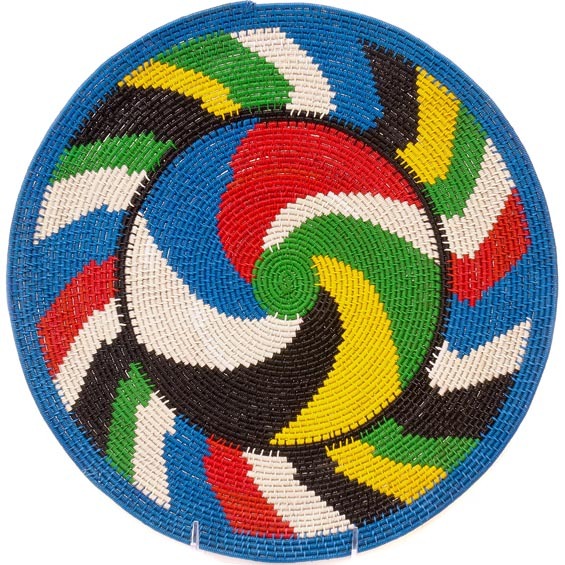 This technique lends itself to the weaving of patterns made famous by traditional Zulu beadwork and also the weaving of 'picture plates'. This basket style is the most time consuming of all the wire baskets to weave. In the larger sizes, adding just one row to the outer rim while weaving can take 10 times longer than a row at the inside. This is why you will see the prices get exponentially higher as the sizes get larger. Just adding an inch to this type of basket could represent an extra week or more of work on a large basket. Mesmerizing designs and vibrant colors are a hallmark of this functional art. Wash gently with warm soapy water.